This creature was full of confusions and hypocrisies. He told Padma that she shouldn't let others dictate her life or talk her into doing anything, he even said not to listen to him - and then it continued to cajole her into coming with him. He was untrustworthy, but like a spider he had spun his web around her. "Well..." Padma reached her hand out slowly, but kept it a few inches from Foo's. She was clearly still torn. Her father's voice shouted to her from just outside the door, frightening her and making her lurch forward, where her hand touched Foo's. Hehe so easy. Make em confused and they'll go towards the thing they want more. People were so easily to manipulate. "heh looks like you made your decision. Well hold on." Foo said as he began to glow so brightly, blinding Padma. When she could see again she was on the back of a large lion like creature. Was it Foo? It had to be. Foo roared and charged forward into a portal that opened up in front of him. Once they were through Padma found them in the air, high above her home. They were flying!! "Hold on tight." Foo said to her. "N-no! Wait!" Padma begged, but it was already too late. The light was dizzying, and the girl shielded her eyes with her arms. Suddenly she lurched forward, and threw her arms down to steady herself. "Ah!" A rush of wind and the sun on her back. They were high, so high above the ground. Padma screamed briefly, not just at the height but at the huge beast beneath her. Was this Foo? Of course he could also become giant and fly, why had she expected any less of this strange creature. She was so full of emotions right now - fear, sadness at leaving her family, fear, anger at Foo for taking her, fear, but also... Exultation. She was free and she was going beyond anywhere she'd ever gone before. Ahead of them, the grand Alborz stretched high into the sky, dominated by the mighty Tochal mountain. Padma had never seen beyond these before, until suddenly they were over them and looking down onto the metropolis of Tehran. A city of concrete, glass, and heights. It was breathtaking. They started swiftly moving through the sky, giving Padma a beautiful look at the scenery. It was indeed breathtaking. "I am searching for more shards like yours. I think I've found one. It seems to be on some island far from here." Foo said in a very deep and powerful voice. Foo began running through the air, somehow, and opened up another portal. Foo ran straight through and there was another bright flash, and then....Padma could feel a gentle breeze and smell fresh ocean water. When she opened her eyes she could see that they were gliding across the ocean, headed for an island that was nowhere near her home. Padma shielded her eyes again, and in her blindness she was greeted by a salty scent. And a sound, above the whooshing of the wind, a different sort of rushing sound that was somehow deeper and more alive than the wind. She uncovered her face and looked down into the vast blue sea beneath them. In all her life, Padma had never seen this much water. From a distance, once, when she was very young, she saw the shores of the Caspian Sea, but never anything like this. It took her breath away. To think that there was this much water in the world... Ahead, an island covered in more greenery than she'd also ever seen. What wondrous place was this? "This place is quite a bit different than where you're from. Probably because it's on the opposite side of this world." Foo said as they approached the island. Once they got closer, they could see people surfing on the water. They got really close to a few, but it didn't seem like any of them noticed Foo and Padma. They arrived at the beach and Foo turned back to his small little feline form. "Looks like we made it. The shard should be somewhere nearby." Foo said as they stood on the beach. Padma was thrust into this new world so violently that she had no time to absorb the fact that she was on the other side of the world. But this sand... It was whiter than the yellow sands she grew up in, but it was familiar. Her feet sunk in just the same. But then there was water as far as the eye could see. It was incredible! Padma's eyes streamed with wonder and joy. She couldn't stop staring at it. While Padma was engrossed with the feeling of being somewhere new, Foo noticed something. He floated in front of other people, but instead of looking at him, they all looked at Padma, who certainly stood out amongst all the people in shorts and bikinis. "Hmmm...seems normal humans cant see me. Guess you can cuz you have a piece of the artifact in you. Well that certainly will make things easier." Foo said with a grin as he floated back to Padma. "Ok Padma. I narrowed down the location to this beach. Now we just need to find our next shard." He explained to Padma. Padma was only half listening to what Foo was saying. "Yes, hmm, of course," she murmured. Around her on the beach were people who were nearly naked. Padma had never seen so much skin in all her life! She didn't even really look at herself when she bathed, though that was rare in her desert village. Yet she couldn't help staring at the people who stared back at her, admiring the big bodies of the men and the boldness of the women. Some of them had beautifully pale skin, like clouds, and some had hair as yellow as the sun. What were these strange creatures? Foo sighed and rubbed his temple. Looks like seeing these new types of people had put Padma into some kind of shock. Foo supposed he couldnt blame her. From what he saw Padma's people didnt even look at their arms and now she was seeing people exposing quite a bit of skin. Foo was about to go investigate by his own when someone bumped into Padma. It was a friendly looking guy who had very dark skin. "oh im sorry nani. Didn't mean to bump into ya. Gotta hit the beach before the waves go bad. A hui hou. Dat's a cute cat by the way." The boy said as he waved and ran off. "Wait...did he say cat? He could see me! Padma we gotta go after him!" Foo said. Padma nearly jumped out of her skin when the boy brushed past her. "Ah! Oh, forgive me brother," she said, averting her gaze and bowing her head like she was preparing to be hit. But the boy with his strange language and sun-tarnished skin was gone before he could scold her for daring to touch a man. She stared after him, admiring how his brown hair had a few streaks of gold running through it. It didn't sink in that he had noticed Foo until Foo pointed it out. "Huh? He did notice you!" she realised. "Lets get after him then! He has to have another piece of the shard." Foo said as he quickly pulled Padma after him so they could catch up to the strange boy. They kept on and found him further down the beach, heading into the water on a surfboard. "Guess we gotta wait for him to come back." Foo said. However, while they were watching him, they could see the shadow of something behind him in the water. "Hey padma....do you see that?" Foo asked her. "Hm, yes," Padma murmured, watching the shadow following the boy. She was distracted by the water again, and without thinking, she kicked off her sandals and waded into the shallows. Ooh, the water was just the right temperature, not warm or cold. Padma sighed with content. She wondered what the boy was doing on that long wooden board. Foo sighed. Padma did not seem concerned about the large shadow of a thing that was headed straight towards the next shard. 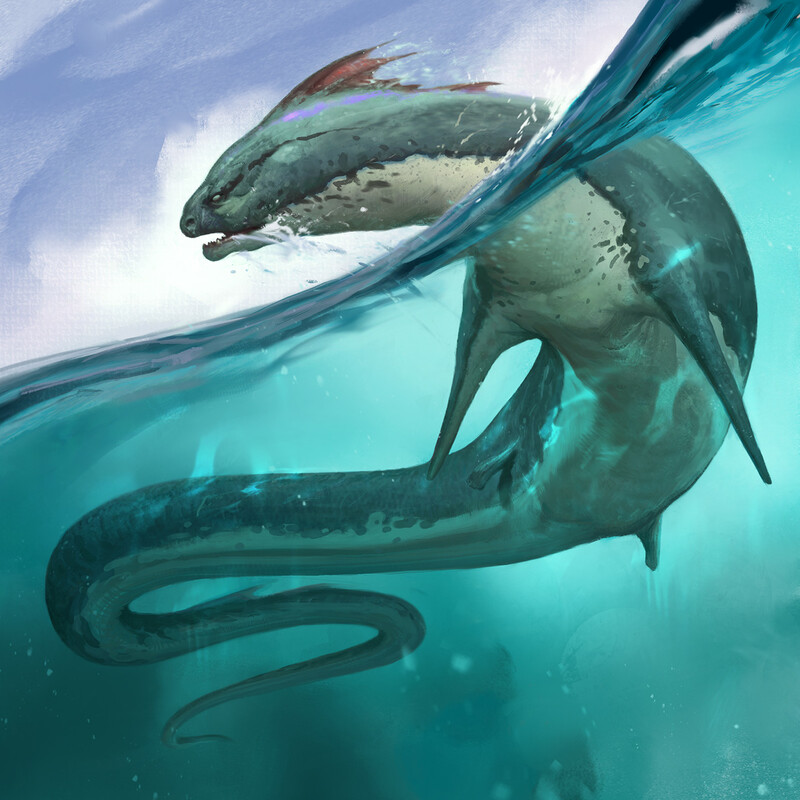 As The boy was surfing on a large wave, a rather massive creaturecame from the water and made a huge splash. Everybody started screaming and running away, as a wave was headed towards the beach. Foo transformed and grabbed Padma before she was swallowed by the wave. "Is that thing normal?" Foo asked. He did not know how the animals worked in this world. Padma yelped as she was dragged away. "I-I do not know!" she confessed. "I have never seen this much water before!" She assumed that nothing lived underwater due to her own ignorance. Guess that was wrong. "Regardless that guy from before is in trouble. See if you can channel the power of your shard so we can help him!" Foo said. If he was eaten or something, Foo would have a harder time acquiring the shard, so hopefully Padma could use the power of her shard to save him before he died. "close your eyes and focus on the shard." Foo said. They needed to hurry because the boy was doing his best ot get away but was being chased by the monster. As soon as padma did she could feel something swelling from inside. It came from her head but then radiated throughout her entire body, filling her with power. She could feel herself changing, becoming stronger. If she opened her eyes she would see that she was wearing something quite different, but whatever it was it was giving her power. Padma was entranced by the beautiful blue abaya that she now wore, but then was horrified to see that it had a slit all the way up the middle to her abdomen, and her sleeves were merely long flaps over her arms that blew back to reveal her bare skin. It was paler than might have been expected for a Persian girl, but that was because she'd been good in covering herself all her life. At least her hair was covered by a loose hood, but Padma felt most exposed in the strange shiny black boots that clung all the way up her legs. She felt powerful, of course, but also vulnerable. "F-Fooooooo!" she whined. "Hey dont blame me I didnt make that outfit! But that's besides the point. I can feel power emanating from you! You should be just strong enough to fight that monster. Lets go!" Foo said as he flew them towards the beast. The boy was still valiantly swimming away from it but it was catching up quick. "Can't we just save the boy?" Padma asked. Foo was big enough to carry the boy on his back too. Padma didn't like the idea of hurting something, even if it was scary to look at and about to hurt another human being. "ill grab the boy, you fight the creature. We have to stop it before it eats the cr...the boy and the other humans." Foo said, quickly correcting himself. COuldnt let Padma think he only cared about the shard, especially since he knew she could transform like this. "Just go down and punch the thing. You dont have to kill it." Foo said since she seemed to be having reservations. Padma looked tormented by this. On the one hand, a human's life was superior to an animal's, on the other she hadn't ever hurt something before. The killing of goats and chickens for food had always upset her. Not to mention, this creature was quite frightening. "I cannot swim," she protested once more. They were out over the water now. Padma didn't even understand the concept of swimming. "learn. We dont have any time left!!" Foo said as they were almost on top of the beast, who was just about to eat the young surfer. It was now or never. If Padma didnt do something, the boy would be eaten!!! This was totally ridiculous... But Padma would not be favoured by Allah if she did not do right by this innocent young man. Sighing, Padma reluctantly slid off Foo's back and plummeted towards the creature. She screwed her eyes shut at the last minute, realising that she might get hurt and drown from this. She felt her body moving without her instructing it to, and when she'd opened her eyes she was back on Foo's back. Little did she know that when she got near the creature, she'd executed a perfect kick to the back of its neck, with an odd formation of water pooling around her leg and giving extra power to her kick. The beast was pushed deep underwater from her kick, and she had sailed gracefully back up onto Foo's back. "Eh?" Padma looked at Foo in confusion.